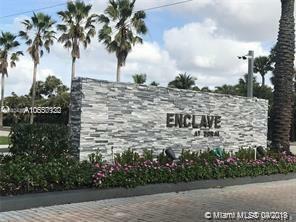 Great 1/1 Apartment located in the most desirable community... Enclave at Doral. Enjoy a convenient lifestyle with resort-like amenities in a beautiful and secure gated community. Spectacular location right on 107 Ave and 41 Street, with easy access to main highways, and close to A+ schools, parks, shopping, restaurants, entertainment, and the Miami International Airport. Unit in great conditions with wood laminated floors. This won't last!